A birthday fete with family and friends celebrating a special lady in their lives, takes on a sophisticated elegance with a touch of precious metals and a vintage twist. 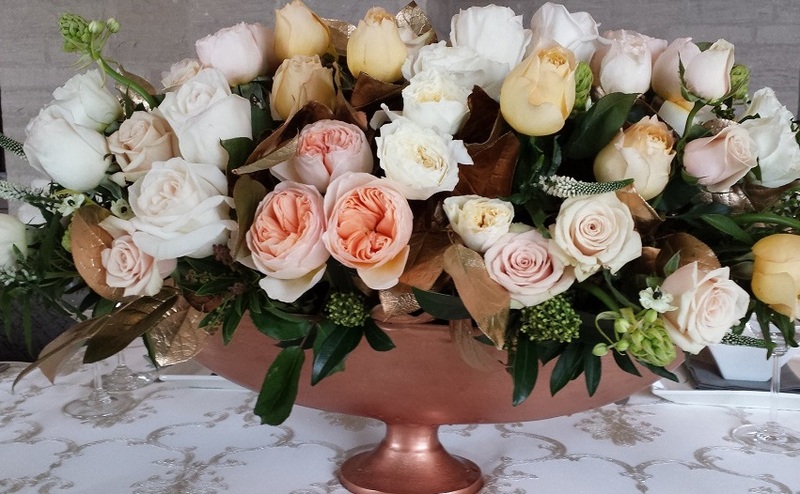 The lush, focal arrangement of romantic Juliet and Patience garden roses, warm champagne Sahara roses, feathery veronica, star of bethlehem, pieris buds and hints of gold dipped leaves cascaded softly over a rose gold compote. The clients own collection of vintage ladyhead vases, filled with sweetly small clusters of ivory blooms added to the light, feminine air.